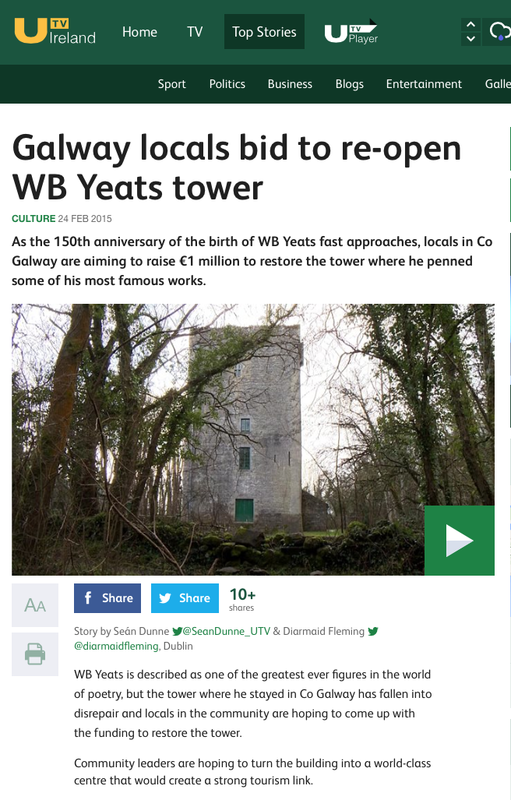 The Yeats Thoor Ballylee Society development project is the subject of a feature news item on UTV. ‘For many people, W.B. Yeats is commonly associated with Co Sligo but it was in fact in Co Galway that the famous poet spent thirty summers and penned some of his most memorable work. Speaking to UTV Ireland, Sister De Lourdes Fahy of the Thoor Ballylee Society said: “My people owned quite a bit of land around the castle and they used to supply the Yeats family with milk. “Very often my father brought Yeats down in the pony-and-trap from Thoor Ballylee down to Coole Park. He did not talk, he didn’t have much in common with young farmers. He loved writing about peasants and fishermen but in actual fact he found it difficult to relate to them. “I suppose he was composing poetry all the time,” she added. The locals are now facing a much more ambitious plan – to raise one million euro by June, the 150th anniversary of his birth.